Trained your glutes for sometime and still not achieving the results you want? Maybe it’s time to check on the angle between your lumbar spine and sacrum. 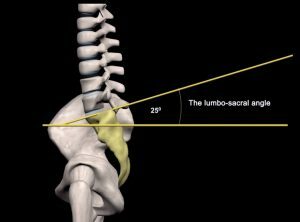 A normal lumbar-sacral angle is 40 degree. 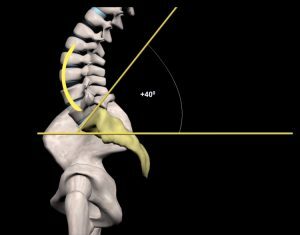 If the angle is larger than 45 degree, curve of the lumbar spine is excessive inward (Lordorsis). when the lumbar-sacral angle is smaller than 25 degree, the sacrum is posterior tilted and lumbar is straighten. 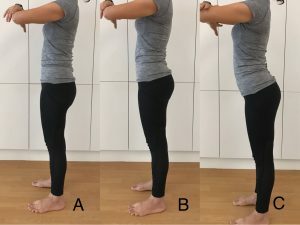 In this posture, the glutes are normally flat. 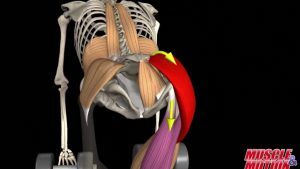 Gluteus maximus are connected to sacrum and it is crucial to maintain the curvature of the glutes. If this muscle is always tighten and shorten, we are not able to train this muscle effectively. The red colour area is gluteus maximus. In order to firm up your glutes permanently, it is crucial to adjust the lumbar-sacral angle between 30 to 40 degree. From the above picture, we can observe easily how the lumbar-sacrum angle affects the shape of our glutes. In picture A, pelvic is posterior tilted, lumbar-sacral angle is less than 25 degree. it is easily noticed that the glutes are flat. In picture B, pelvic stays in neutral position and lumbar-sacral angle is 40 degree. The gluteus maximus muscles are engaged well in this position. In picture C, pelvic is anterior tilted and the lumbar-sacral angle is more than 40 degree. In this posture, we are not able to engage our abdominal muscles and glutes at the same time.